What’s for Dinner? If that brings a feeling of panic, read on my friend! Between work, workouts, and kids’ activities, it’s a struggle to get dinner on the table–not to mention something everyone will like! You are not alone–the struggle is definitely real. But not to worry because I’ve got some tricks you can use to make meal prep a snap! Meal prep can be done many ways–from taking a day and cooking enough for a week or month, to cooking a little extra each time you cook so you can have planned leftovers. Or something in between. Personally I use a variety of meal prep techniques including batch cooking and freezing and creatively repurposing leftovers. I’ve reach out to my dietitian colleagues for more tips. This may seem like a no-brainer, but the planning is critical for meal prep to work. So sit down and think about what you want your week of meals to look like. Look at your family’s schedule too to see what works when. Because it definitely doesn’t work if you plan a large meal on the nights your son has soccer practice! If you’re watching your food budget (and who isn’t?) sit down with your local grocery ads and see what tempts you. Ever wish you could meal plan like a dietitian? Here’s how I like to plan/meal prep. I like to make a somewhat flexible meal plan for the week.I recommend planning the 3-4 protein foods and some prepared side dishes for the week and also how to repurpose them. For example, grill steaks on Sunday, have leftovers as a main dish salad. Buy a rotisserie chicken and use leftovers for chicken salad, tacos etc. In the winter we usually make a blended veggie soup, grated carrots with vinaigrette and a pot of beans or lentils. Have some frozen or fresh veggies on hand for sides and you’ve got a solid but flexible plan for the week. Find more ideas to eat more veggies here. 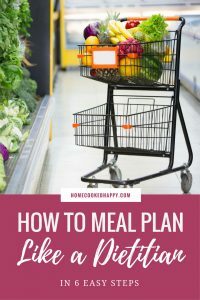 Kate RD from Home Cooked Happy has got you covered with her post How to Meal Plan like a Dietitian in 6 Easy Steps. She even has a free meal planning toolkit. Kate also has a lot of other great resources on her blog–from themed meal plans to back up meals for quick weeknight dinners. If you’d rather have a dietitian plan your meals, check out Jenna Gorham RD’s subscription-based meal-planning service. Menus and recipes delivered to your inbox. 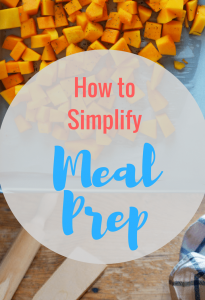 I really love the meal prep advice in this post How to Simplify Meal Prep by Sarah RD at Bucket List Tummy. Making a menu is critical as is all other sorts of lists to get organized. I use many of the techniques she recommends, Like making a list, batch cooking and best of all being realistic!! She goes step-by-step on how she goes through meal-prep steps. Meal Prep in a Muffin Pan! Really? yes! I had a college roommate that used this technique many years ago–way before the term “meal prep” was trending. She used to make little mini-meat loaves in a muffin pan. She was on a strict budget and this really helped her meet her budget and have some ready-to-eat eat some ready-to-eat healthy meals. 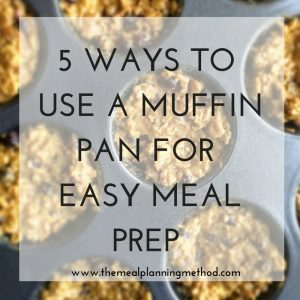 So fast forward to this blog post 5 Ways to Use a Muffin Pan for Easy Meal Prep by Christy and Lindsey, Registered Dietitian Nutritionists. The ideas are unique–from freezing soup in muffin tins, so you can easily take a few out at a time, to mini-frittatas. They focus their whole website The Meal Planning Method, on eating well by meal planning. Free resources include a printable weekly meal planner, master meals printable and even a Thanksgiving Plan & Prep List. And of course, they can help you with one-on-one help too. Jennifer Hunt RDN has some great ideas for tools and techniques that make for quick family meals. Sometimes the simplest ideas are the best, and she’s got some good ones there in her post Faster Weeknight Dinners-Strategies That Really Work. My favorite idea is to cook extra whole grain rice or farro (which usually takes longer than white rice) and freeze for later use. I’ve done this and it’s awesome, because let’s face it, sometimes time is the only thing standing between you and whole grains. Am I right? 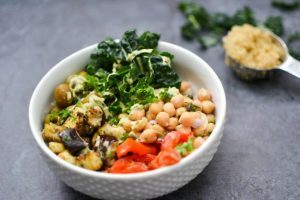 If you’re not sure what a Buddha bowl is or how to make one, check out Katie RD’s post 3 Step Mediterranean Buddha Bowl. So how does making Buddha Bowls help with meal prep? Make the individual ingredients in advance and then you’ve got super-healthy quick meals for lunch or dinner. By having several different options for veggies or protein, you can set up a Buddha Bowl Bar for quick but pleasing family meals. 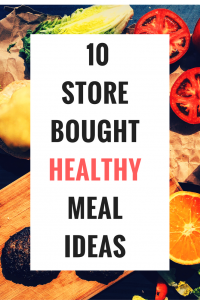 Dixya RD, from Food, Pleasure and Health has some great ideas here in her post 10 Store-Bought Foods for Quick Healthy Meals. If you need inspiration, she’s got great ideas for using canned beans and rotisserie chicken as well as which canned soups are best! 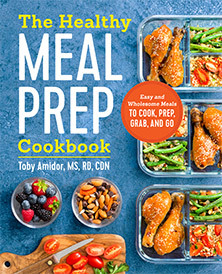 And last but definitely not least, I’d be remiss if I didn’t mention my colleague’s latest book, The Healthy Meal Prep Cookbook by Toby Amidor MS, RD. Toby spells out the different ways you can meal prep (kind of like in this blog post, but with much more detail!) I love how she really gives you all the tips you need to get started–like what kind of containers to stock up on to store the fruits of your labor! (I like that she stresses BPA-free and is partial to glass.) And guess what–not all foods freeze well–and she discusses that too! You can find Toby’s book here on amazon.com. « Should You Drink Coffee While Pregnant? What a great post! I love the tips on building family meals and the muffin tins are awesome! I am a big fan of Toby’s book! So incredible!